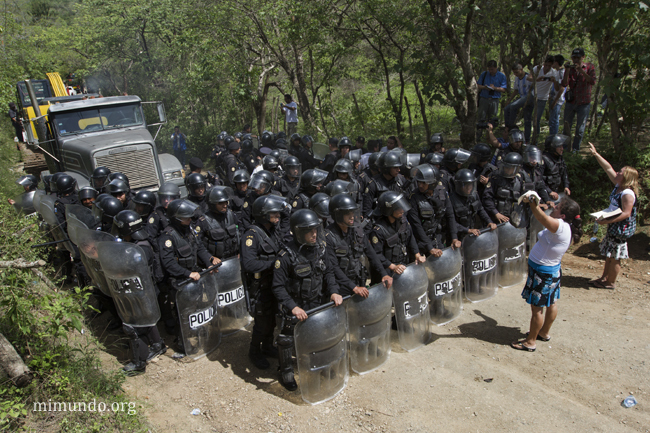 (23 May 2014) After two years and two months of peacefully blocking the entrance to US-based Kappes, Cassiday & Associates (KCA) El Tambor gold mine, local residents of San Jose del Golfo and San Pedro Ayampuc were violently evicted by Guatemalan Police forces in order to introduce heavy machinery inside the industrial site. Led by the local women, members of the La Puya resistance prayed and sang until they were faced with tear gas. Numerous locals were injured and detained. Local leader Yolanda Oquelí, who suffered an assassination attempt on June 2012 due to her involvement, warns the Guatemalan government will be held responsible for any blood spilled. The Police were successful in forcibly introducing the company’s machinery into the mine site. Nevertheless, locals claim they will continue what they deem a just and fair resistance in defense of life itself.